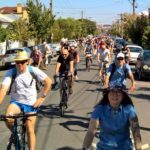 It’s estimated that soon after Australia’s bike helmet law went into effect, as many as a third of the nation’s regular bike commuters simply quit riding altogether. This is truly a case of a law meant to increase safety doing more harm than good. It should be apparent that safety in numbers is the best line of bike defense. Opposition to mandated helmets has been growing for years in Australia, with one politician there calling for a government inquiry into this and other so-called ‘nanny state’ laws in the summer of 2015. NYC has no helmet law, 38 million bike share trips & 0 deaths. As it’s been said so many times before, you can promote cycling, or you can promote helmets. You can’t promote both. Here’s hoping the people of Australia keep breaking ridiculous rules until their helmet mandate gets tossed for good. There’s far too much at stake not to. Copenhagen’s bicycle ambassador talks about how important the bicycle is for liveable cities and how bicycle helmets are threatening bicycle culture. About TEDx, x = independently organized event: In the spirit of ideas worth spreading, TEDx is a program of local, self-organized events that bring people together to share a TED-like experience.